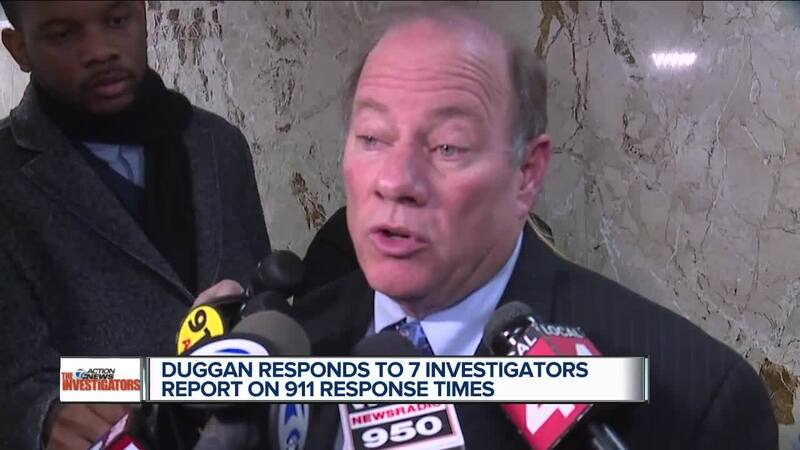 Detroit Mayor Mike Duggan responds to the 7 Investigators report on 911 response times. DETROIT (WXYZ) — Detroit Mayor Mike Duggan defended the city’s response times for urgent calls to 911 in wake of a 7 Action News investigation, but vowed to address problems revealed by the report. In a months-long investigation, 7 Action News repeatedly reported that the average response times for the most urgent 911 calls in Detroit hovers between 12 and 13 minutes—a big improvement from years ago. But that’s not the whole story. Some 3,000 priority 1 calls—including rapes, armed robberies and active shootings—took 30 minutes or more just to get a response last year. Hundreds took an hour or more. Last year, nearly 20,000 priority 2 calls—that include assault and battery and unarmed robbery—took an hour or more just get a response. “What Chief Craig is looking at is which are times that were delayed because we had an unusual spike in calls, and which are calls that were delayed because there was a problem with the call taker or the dispatcher,” Duggan said. Duggan's comments came today after he presented next year's budget to the Detroit City Council. It calls for a $10 million increase to Detroit Police with the hopes of hiring 70 new officers. As we reported last month, calls to 911 are almost daily being put on hold because of a lack of people to answer them. That’s what happened when Stephanie Chambers called 911 in November 2017 while her boyfriend bled from his neck. He had slit his throat. When Chambers finally got through, EMS made the scene quickly but because a weapon was involved, they weren’t allowed to enter until police arrived 14 minutes later. By that time, her boyfriend was dead. For months, we’ve asked DPD for the number of calls put on hold a year. They still haven’t responded. Last week at a meeting of the Detroit Board of Police Commissioners, board members asked what steps were being taken to address problems identified in our report. Assistant Chief James White said new measures have already been taken and more are in the works.